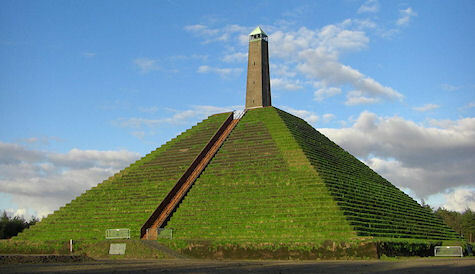 At the highest point of the Utrecht Ridge, in the Dutch village of Woudenberg, stands Europe's only pyramid. The earthen hill was built in 1804 by Napoleon's soldiers, under the direction of General Marmont as a tribute to his friend and example Napolean Bonaparte. Marmont called it 'Mont Marmont.' But in 1806, despite protest from General Marmont, Louis Napoleon, the new king of Holland, renamed the hill the Pyramid of Austerlitz in memory of the Battle of Austerlitz in which Napoleon decisively defeated the Russians and Austrians.